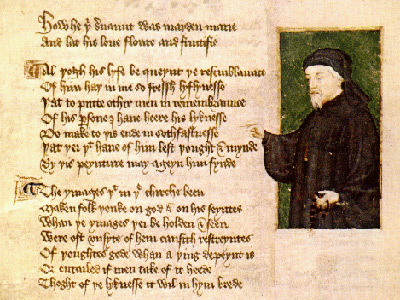 William Morris repeatedly acknowledges his debt to Geoffrey Chaucer in The Life and Death of Jason, produced the great Kelmscott Chaucer with Edward Burne-Jones in 1896, and had his narrator William Guest declare in News from Nowhere that he ‘fairly felt as if [he] were living in the fourteenth century’. He might, therefore, have been very interested in a curious academic-administrative practice adopted at Oxford University in the 1920s. When Professor George Gordon returned to Oxford from Leeds University to take over as Merton Professor of English Literature in 1922, he set up a postgraduate seminar which was attended by such students as C.S. Lewis and Nevill Coghill, who would become Oxford luminaries themselves in due course. A decision was taken – whether by Gordon himself or by the postgraduates, I’m not sure – to keep the minutes of each meeting in Chaucerian verse, and some of these minutes survive, including some fine lines by Coghill describing Lewis’s paper on Edmund Spenser on 9 February 1923: ‘Then to Sir Lewis turned the Professour/(That was our tales juge and governour)’, and so on. Minutes in Chaucerian verse – what an admirable and learned idea! And how apt, one would think, given Morris’s own Chaucerian passion, to the various international Morris Societies today. So I commend this old Oxford practice to the Morris Society committees, although they might in turn object that, in certain moods, Morris would accuse Chaucer of betraying English by his excessive openness to French and Italian literary traditions. In which case they would then be obliged to take one further philological step backwards and have their minute-makers write up their notes in Gawain-style alliterative verse or Anglo-Saxon or even in Old Icelandic itself. and wondered if it was in any way related to you, or if you would be visiting it. So I googled, and was more than moderately delighted to realise you still run this blog - which I will now settle down to peruse far more thoroughly. I hope the sun has found Lancaster so you can picket and bask simultaneously: I'm sure there's more grit behind a wintertime picket, but there's nothing that isn't improved with a fair dose of sunshine. Hi Jane, Just back from my travels down south (UK that is, not Europe). Thanks for this message, and it's good to hear from you. Barcelona is such a fine place that any pretext will do to get me out there, but this exhibition looks very impressive in its own right too. So I shall endeavour to parachute down for it at some point. Hope you're enjoying your time in that wonderful city (what are you up to, exactly? ), and that you have good plans for the next few years. As you'll have gathered from my pensions strike posts, academic life is a stressed and grim thing in the neo-liberal university, so maybe not doing that PhD on Van der Post was the right decision after all. Best wishes for all your future endeavours! Yes, I read about the picketing. Thinking about it, I have more friends who have left academia due to frustration or burn out than any other profession - even more than law, and I will never know how people work those hours. I'm probably best off out of it... I'm still drifting around on the fringes of reality, in Barcelona for three months doing some advising at a school here (yes, I am apparently in a position to give advice these days - terrifying notion for all concerned). Last year I bought a cottage in Brittany and am hankering to get back there: it may be France, but I'm determined to create the ultimate English Country Garden in my small patch. Best of luck with the protests, I'll keep checking in here to see developments.